Always look forward to my appointment with GardeNails each month! After few manicure sessions with GardeNails, this time I’m going to try out their signature Crystal Mud Spa Pedicure! Lavender Sea Salt in the water! GardeNails provides FREE Sea Salt for all Classic Pedicure service! No extra charges for sea salt!! Pedicure tools! GardeNails is very particular in hygiene, all the tools will sterilize in sterilizing machine before use. Getting started! File and Shape my toe nails! Most important part, remove dead skins of my feet! And now! Crystal Mud Spa! Pour the Crystal Mud Spa pack into the water.. There are 6 types of Crystal Mud Spa for you to choose from. Depend on your needs choose the type that you like! And slowly the water will turn into crystal mud! Soak it for 15 mins and you will see the amazing result instantly! After 15 mins, wash off the crystal mud, they will use the warm towel from the Towel Steamer to clean my feet. Dry my feet with warm towel will soothe tired feet. Best for ladies who wear heels often. GardeNails uses Poshe Base Coat and Quick Dry Top Coat for all Nail Services. No additional charges for Quick Dry Top Coat! Superb right?? Poshe Quick Dry Top Coat! My clean blue nails is done! The crystal mud spa shows amazing whitening effect instantly! GardeNails Classic Pedicure is only for $30! And guess what, they are giving FREE Crystal Mud Spa for Classic Pedicure Service! You can enjoy Full Classic Pedicure with Crystal Mud Spa for just $30! you just need to add $8 to enjoy the Crystal Mud Spa! Call 6310 2669 or text 98517141 to book your nails appointment now! GardeNails is having a Like & Share Facebook Promotion! Like & Share the promotion picture now!! 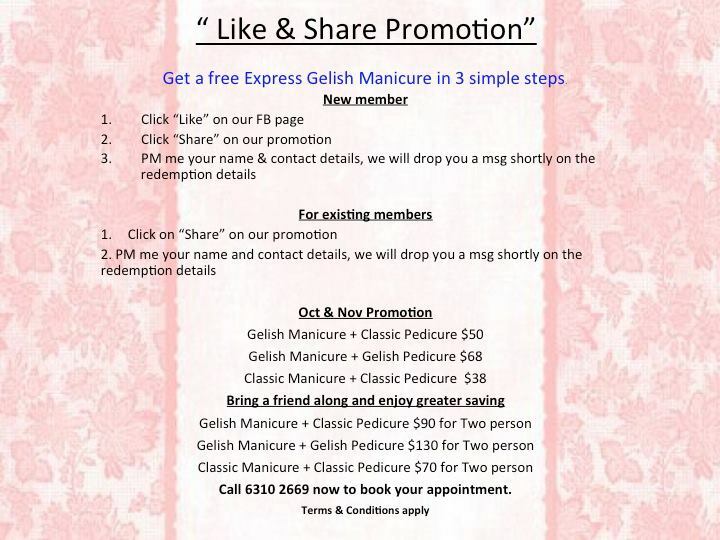 Drop a message to GardeNails to redeem FREE Express Gelish Manicure! Foot spa therapy is very essential after long time walk.Foot spa make our feet shining and refresh.So we need a healthy and best foot massager spa therapy after long time walking.